Kacey Wong (b.1970) makes experimental art projects that investigate the space between men and their living environment with a social intention. He thinks being an artist is similar to being a detective, the case on hand is to investigate the self. He was the winner of 2012 HK Contemporary Arts Award given by HK Art Museum and Best Artist Award in 2010. 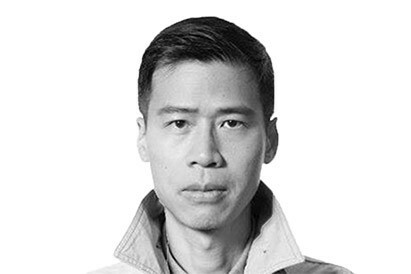 He is the founding member of Art Citizens and Street Design Union, which investigate artist and designer’s role in social political causes, also a former member of Para/Site Art Space. His mobile tricycle project Wandering Homes was featured at the 2008 Venice Architectural Biennale in Italy. His floating house Paddling Home was performed in Hong Kong’s Victoria Harbour and his mobile bulk bed Sleepwalker was the star feature during the 2010 and 2012’s Hong Kong & Shenzhen Bi-City Biennale of Urbanism\Architecture exhibition. The Real Culture Bureau, filmed in Hong Kong by local artist Kacey Wong, portrays a corrupted government official, which for the artist embodies money and violence often seen in mainland China. 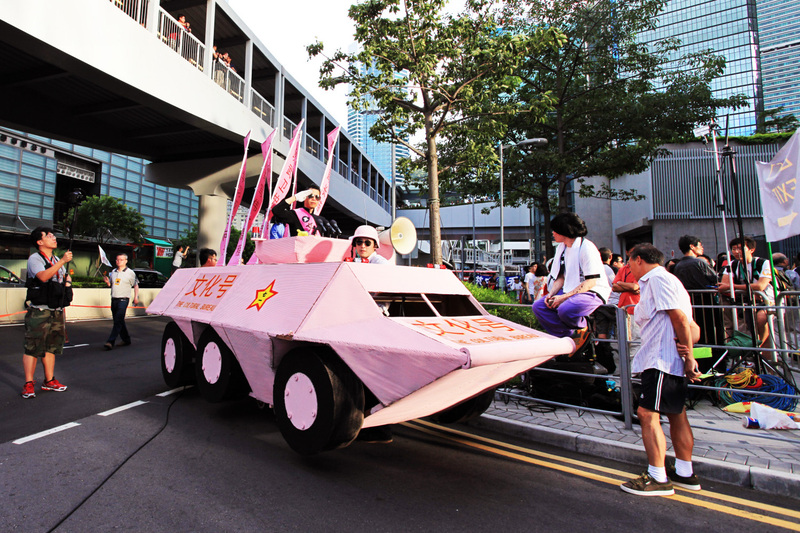 The artist built a pink tank out of cardboard, rode it through downtown Hong Kong, and threw fake money to real politicians and other real local political parties to prevent them from putting up resistance against his imaginary Pink Party and demanded harmonious silence from them. This performance, just executed a few kilometers north in Mainland China would have him earned at least a jail sentence in one of their notorious prisons, currently temporary houses for many artists and other free spirits. Kacey Wong has a knack for creating art which investigates the space between people and their surrounding environment. 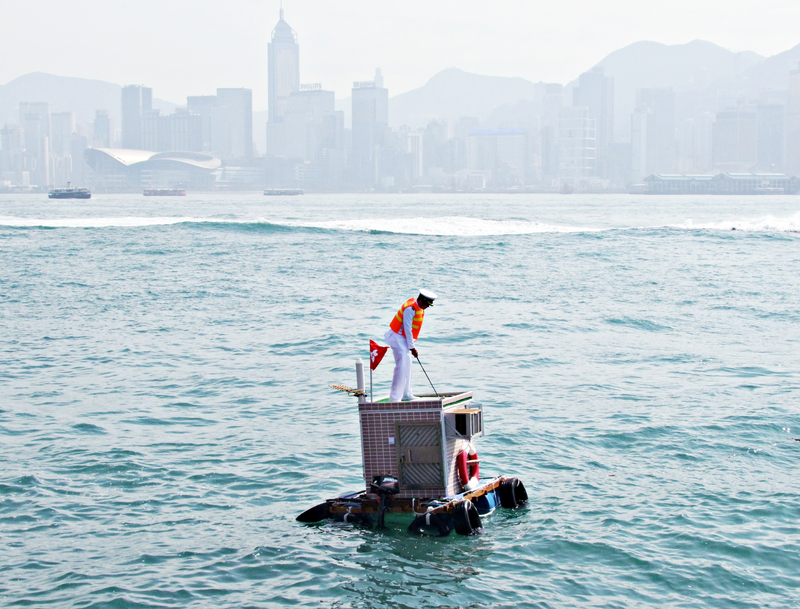 Paddling Home, which was performed on the Hong Kong Victoria Harbor, was a star feature in the Hong Kong contemporary art scene. The project features deep architectural elements, which clearly show in the design. The project also features various functional and commercial aspects. The result of the Paddling Home house was the creation of artwork unbounded by business values or functionality, which allowed it to represent the philosophies of Kacey Wong. The Hong Kong 1 July protests are a surprising sight on the often chaotic stress. This day marks the transfer of Hong Kong from the United Kingdom to China (PRC)1 and is a public holiday it was originally thought to be a day of celebration. However, now it is mostly known for hundreds of thousands of people flooding the streets who protest for democracy, universal suffrage and a variety of other political concerns. This annual protest2 rally started in 1997, the year of the handover, and in 2003 brought out as much as 500.000 Hong Kongers. Only the protest in May 1989 in favor of the participants of the Tiananmen Square protests3 was bigger with 1.5 million participants. 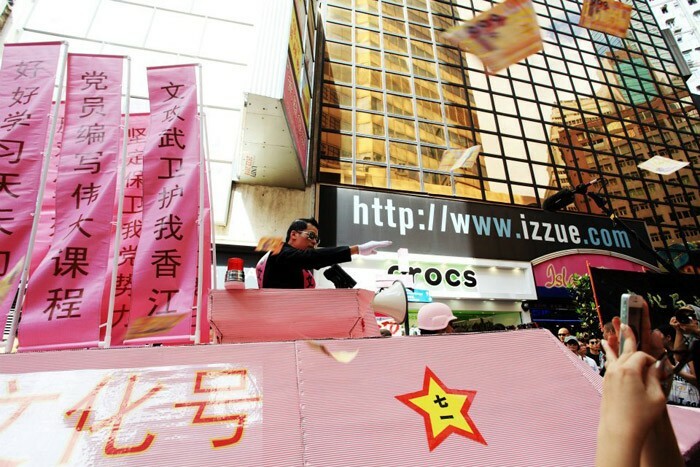 In 2012, 400.000 other citizens took part in the protest, among them Hong Kong artist Kacey Wong. 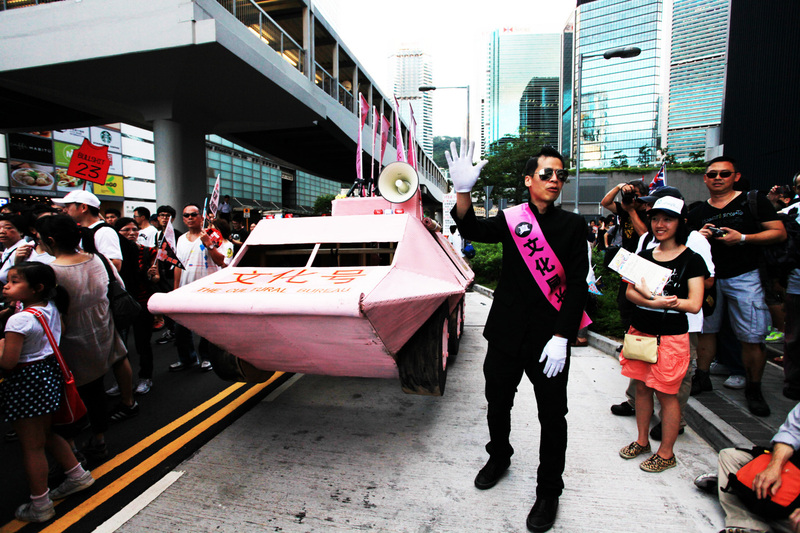 He paraded the streets, using a pink tank made out of cardboard. 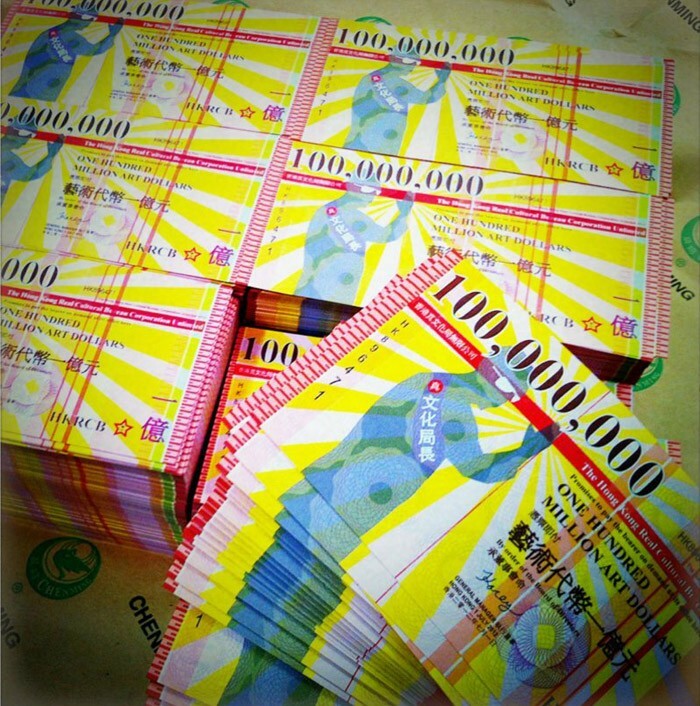 His artwork called The Real Culture Bureau and the Real Culture Bureau director aims to reflect the changing political and cultural situation of Hong Kong and to portray a corrupted government official which for the artist embodies money and violence often seen in mainland China. 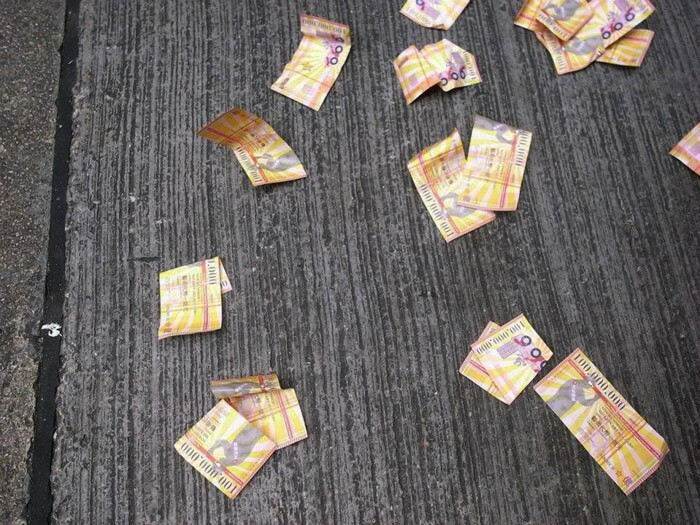 Kacey Wong threw fake money ($100 million dollars bill) to real politicians and other real local political parties to prevent them for putting up resistance against the Pink Party and demanded harmonious silence from them. All images by Kacey Wong/kaceywong.com unless otherwise noted.